ST. GEORGE – Public lands, the Habitat Conservation Plan and the Lake Powell Pipeline were among the questions addressed at a debate Wednesday involving the Republican candidates for the Washington County Commission. 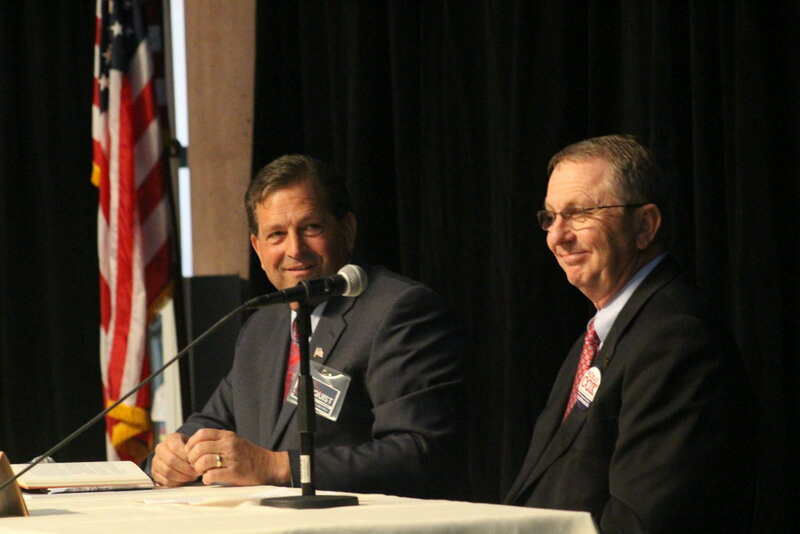 Hosted by the St. George Area Chamber of Commerce at the Dixie Center, County Commission candidates Gil Almquist and Dean Cox addressed the gathering. This debate was the first of two hosted by the chamber Wednesday. 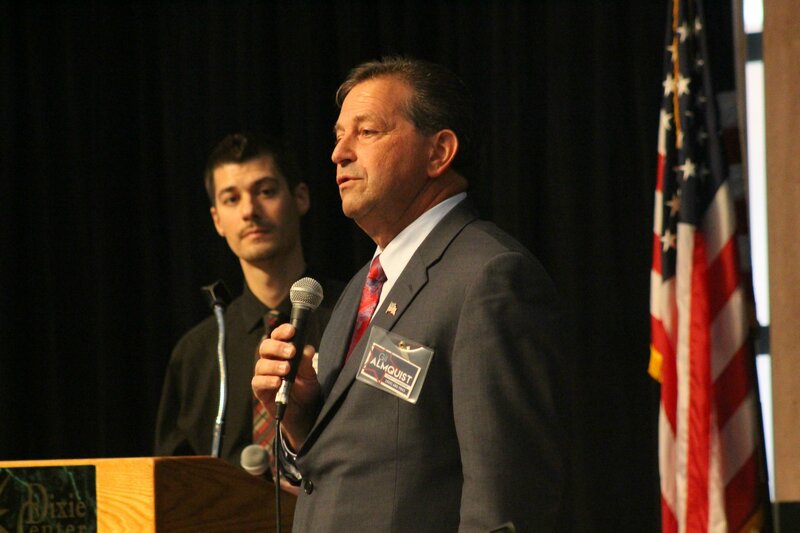 The other debate featured Walt Brooks and Steve Kemp, candidates vying for the Republican nomination for House District 75. “We know there are many issues,” Almquist said at the start of the debate. A former St. George City Council member and city planning commission member before that, Almquist said his experience in city government has helped get him out into the county and learn more about the issues county residents care about. 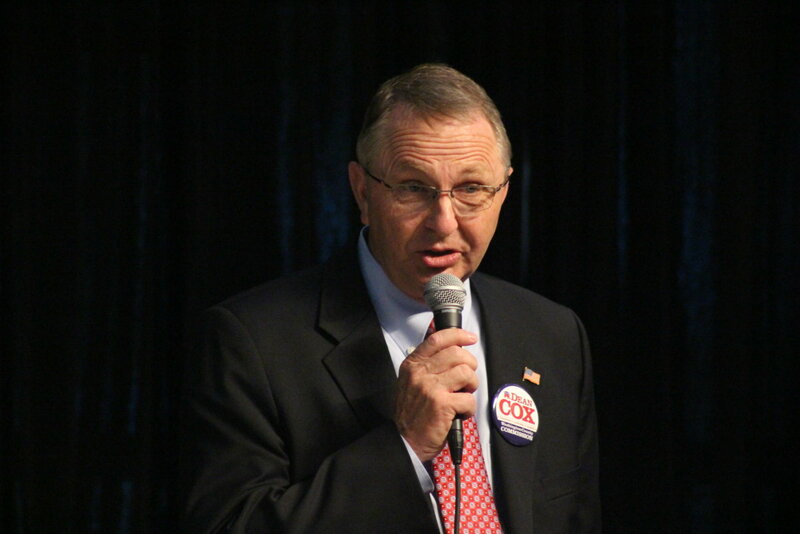 Currently the Washington County Administer, Cox announced he is resigning from the position Aug. 15 in order to avoid any conflicts of interest during the campaign. It was also done so he could be 100 percent available for County Commission-related commitments, he said. “I have no aspiration to be anything more than a County Commissioner,” Cox said, and added that if elected he only plans to serve two terms at the most. Both candidates said the Habitat Conservation Plan, or HCP, needs to be renewed. 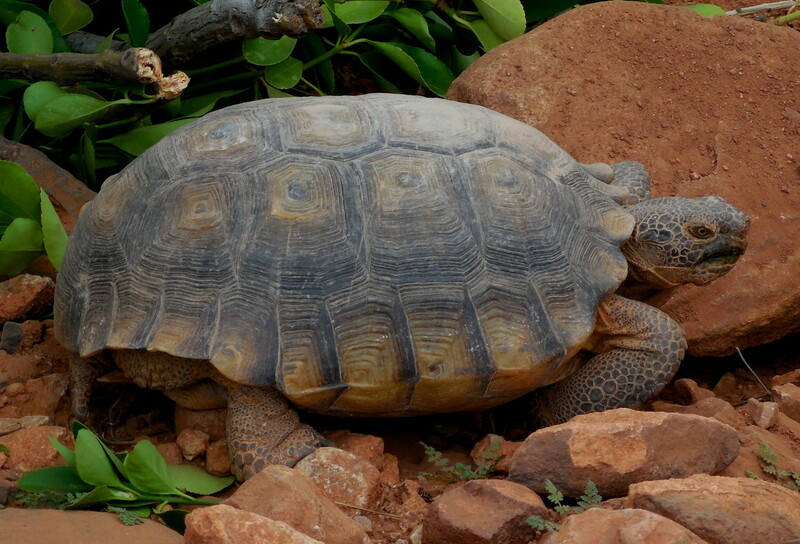 The HCP came into being 20 years ago and set aside 62,000 acres for creation of the Red Cliffs Desert Reserve and the protection of the desert tortoise. Almquist said the HCP should be renewed, but under the county’s terms. He referred to the draft resources management plan the Bureau of Land Management rolled out last year and pointed to it as an example of a federal agency acting against the county’s interests – primarily because it initially didn’t consult with the county about those interests. Measures have since been taken to resolve the matter. Disagreements over the resource management plan temporarily derailed negotiations for the renewal of the HCP, Almquist said. Continuing negotiations must be done with respect toward the residents of the county, he said. “The HCP has been key to the development of Washington County,” Cox said. The county needs to work with the BLM and other federal agencies to renew the HCP, he said. However, those negotiations can’t be done in a “take it or stuff it” manner. “We need to work with them,” he said. Read more about the HCP and renewal efforts here. As for private land owners who lost land to the creation of the HCP, they were promised by Congress through legislation they would be compensated, Cox said. That compensation would come in the form of potential land swaps. One affected land owner, Bob Brennan, has been looking at a part of Sand Mountain near Sand Hollow reservoir. Sand Mountain itself is a popular area for ATV riders and rock-crawling activities. Cox said it was essential to resolve the issue and hopes the county can keep Sand Mountain as it is. Attempting to tell the federal officials what to do in regard to public lands isn’t necessarily going to work – they won’t listen, Almquist said. However, in Washington County, he said the federal agencies are now dealing with a more united front in relation to public land use. “We have to make a steady, strong argument that we will take it from here,” Almquist said. For the federal government to treat the people of the county like they have no say in what happens with the public lands is disrespectful, he said, adding that he plans to work at the local, state and federal level in an attempt to gain more local control over the public lands within the county. When congress voted to create the BLM in 1976 and go from disposing of the public lands to managing them for conservation, Cox called that a violation of an agreement the government made with the state to eventually hand over the lands. The ever-present issue of the Lake Powell Pipeline was raised during the debate. Both candidates support the concept of the pipeline provided it is financially feasible. “It has to be done wisely, and it has to be done well,” Cox said. Washington County needs to secure water for the future of the county, he said, though added all of the area’s water options need to be looked at as well. This includes the use of reuse water and conservation measures. As for the water that would be coming from the 140-mile long pipeline, Cox said Utah deserves to use the water it is allotted by law and it shouldn’t be allowed to go downstream to Nevada and California. While the county has done well to conserve water, Almquist said, it cannot conserve itself into the future. Getting the water from Lake Powell needs to be cost-effective, he said. “We need to know the cost,” Almquist said. The primary election is set for June 28. Whoever wins the primary will face independent candidates Josh Warburton and Greg Aldred in the general election in November. Locations for early voting via the Vote Utah website. LOL ! Two politicians on stage at the same time. double the BS for the price of one. Especially from the former St. George City councilman who violated the city’s codes, that he supported the city code enforcement officers to go after the residents. Yup…that’s a lot of bs there alright! I cannot in good conscience, support either of these “professional, career” politicians. Public land seems like the only thing they really have up their craw. Anyone who has seen the results of the Vision Dixie polling – a process that these folks are supposed to be using as their “vision” for Washington County’s future – knows that under the “public lands conversion for private use” question the majority of people did not support much conversion of public lands. The Vision Dixie public process was conducted in response to the 2006 land bill that would have converted thousands of acres of public lands and the idea was rejected. $500,000 of our tax dollars was spent to get an answer that these politicians don’t like. People who think they will get a better voice through their local and state officials compared to those at the federal level had better think again. These guys aren’t paying attention to what the people have already said! they play the game for cash or notoriety. They are every bit as backward and corrupt as national politicians. That’s why the whole “state sovereignty” crap would never work. These guys are just too corrupt. Tired of politicians? Bored with special interests? Angered by the same ole corruption? Vote for Trump!